At any rate, I’m looking forward to sunny days at the beach and sandbar sooner rather than later. And this cocktail is perfect for warmer weather. 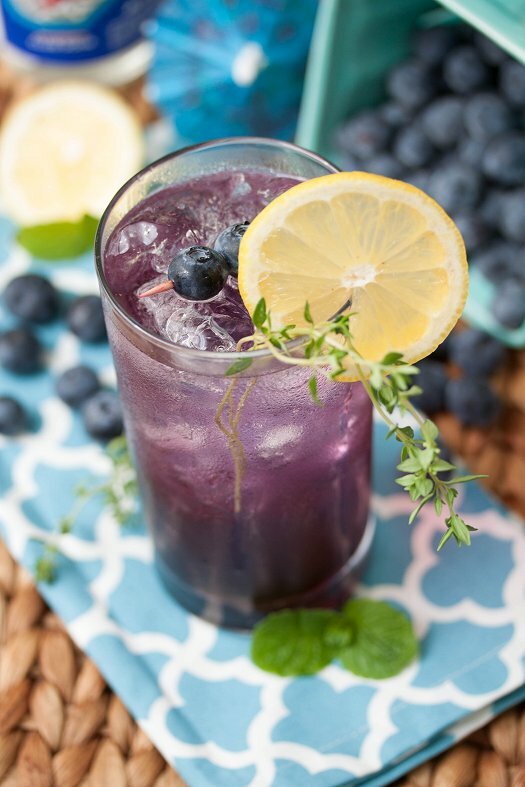 A simple syrup is made with fresh blueberries, fresh thyme, sugar and water. Then the blueberry concoction is mixed with gin, St. Germain, and club soda for a little bubbly flair. 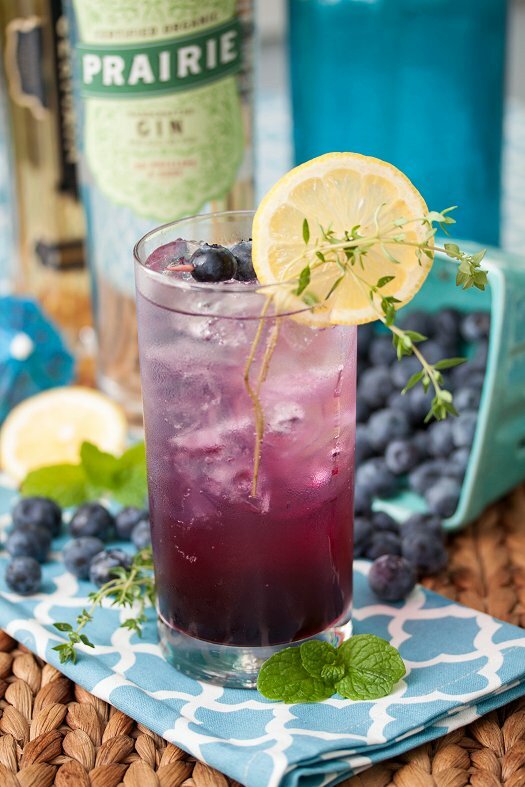 It’s a wonderful combination of sweetness from the blueberries, herb notes from the elderflower liquor and the fresh thyme, and a crispness from the gin and twist of lemon. Very light and refreshing.Garnished with a few fresh berries and a sprig of thyme – it doesn’t get any prettier! I used Prairie Gin, it’s lighter in flavors than many other gins I’ve tried – but still great notes of juniper berries which is perfect in this cocktail. They were kind enough to send me a bottle of their gin, as well as one of their vodkas – and I’m looking forward to doing more experimentation at the bar with them! Be sure to stop by on Monday for another awesome blueberry recipe and a great giveaway to go along with it! I hope that everyone has a great Memorial Day weekend! Combine all of the syrup ingredients in a small saucepan over medium-high heat. Cook until berries burst open and have become very soft. Place a mesh strainer over a small bowl and push the berry mixture through to get out large chunks of skins and stems. Place berry puree in a small bowl or jar. Cover and refrigerate until ready to use. To make the cocktails, fill glass with ice. Add blueberry-thyme syrup, gin, elderflower liquor, and top with club soda. Gently stir to combine. Garnish with slice of lemon, fresh berries, and a sprig of thyme or mint. Disclaimer: I received a bottle from Prairie Organic Spirits for review. As always, all thoughts and opinions are my own. This drink is seriously gorgeous. I love the purple hue! What a refreshing, delicious cocktail! Don’t feel bad…my rosemary and thyme kicked the bucket during our abnormally cold winter, too! Delicious! I made this today. So easy and refreshing. Thank you. This sounds like an awesome summer cocktail! Yum! Thanks! So delish, and gorgeous to boot.